We believe that best way to get to know a culture or a country is by trying the national cuisine. So when you are on a trip to St Petersburg, don't miss our traditional Russian dishes, such as Beef Stroganoff, Borsch, Bliny, Pelmeni, Pirogi, Kotlety and much more. Typical Russian food served in a Russian restaurant. Every Russian dish is rich, tasty, stodgy and made with a dash of French inspired creamy sauces and other delicious flavours. Every Russian restaurant offers warm hospitality and a diverse atmosphere, usually a mix of aristocratic and modern ambiances, that will make your dining experience one of a kind. But with so many Russian restaurants and cafes in the city it won't be easy for you to choose where to eat and drink. So to help you find the best dining spot for a taste of authentic Russian cuisine and atmosphere, we've put together a list of restaurants in St. Petersburg that we like and know, and hopefully are worth of your money. Tip: Please be sure you book a table before you go to any of these Russian restaurants listed on this page, especially on the weekend. Typical Russian restaurant, Warm atmosphere, Friendly staff! Set in a basement down a side street of the famous Nevsky Prospekt you can find the Masha and Bear (Masha i Medved' in Russian), a tourist friendly restaurant serving a variety of Russian and European dishes in a warm and welcoming atmosphere. Aimed primarily at tourists, this is not the best place to eat if you're on a low-fat diet or on a restricted budget. But if you want to experience traditional Russian cuisine in a typical Russian setting, then this place is going to be a real journey of the senses. Real Russian atmosphere, Tasty old Russian recipes, Great service! Hidden inside a building on the northbound of Petrograd Island, there is Chekhov, a charming restaurant run by a Russian family which is very popular among Russians and foreigners alike. If you are looking for a home-like atmosphere and want to sample delicious, old Russian recipes in a rustic 19th century setting, then Chekhov is the perfect place for you. A dining experience here will give you the true feel of Russia and St. Petersburg's warm and welcoming hospitality. A literature loving restaurant with great Russian food and a home-like atmosphere! Name after the famous writer Nikolai Gogol, this elegant restaurant apartment is one of the most interesting Russian restaurants in St Petersburg. Perhaps because of its old-fashioned decorative setting or the harmonious ambience enhanced by the classical music playing in the background, Gogol is a pleasant dining spot where anyone can enjoy authentic Russian cuisine served by welcoming staff. The menu includes Siberian whitefish, hand-made pelmeni, Russian dumplings, local farmer’s beef Stroganoff and Magret de canard, to name just a few; the vast choice here will take you on a sublime culinary journey into the old times of 19th century. Lovely modern restaurant, Tasty local Russian food, European feel! Founded by the Russian musician Sergey Shnurov, the Cococo restaurant is one of the most innovative and modern Russian restaurants in St Petersburg. Offering old time Russian recipes that have been turned into vibrant modern dishes using local organic farm products and seving homemade fruit drinks made in different flavors, Cococo takes you on a spectacular culinary adventure of Russian tradition with a modern twist. From old to modern Russian cuisine, the Chef here will surely delight your palate and soul. If you go, don't miss their seasonal menus! High-class Restaurant, Imperial atmosphere, Tasty Russian cuisine! One of the most popular Russian restaurants in St Petersburg, Tsar recreates perfectly the real imperial atmosphere of the 18-19th centuries while at the same time offering fine Russian cuisine. As the name suggest, the atmosphere at Tsar will make you feel as though you have stepped back in history to the time of the Tsars. Here you will be drinking in fine crystal glasses and tasting exceptional masterpieces of top-class Russian cuisine in an elegant and historic setting. In short you will be treated like real Russian royalty! Classic Russian cooking, Soviet time ambience, Very Russian style! Run by the famous Ginza Project, this Russian restaurant is a unique dining spot not to be missed. From the carpets and pictures on the wall to the old-style record player and old TV shows, Mari Vanna will make anyone feel like they're eating in a typical living room of an old Soviet apartment. Serving very simple, everyday Russian dishes that you would expect your aunt to cook, this establishment is nothing fancy but very tasty. Perhaps for its USSR style setting or delicious Russian food, this is a place that you'll be talking about long after you've gone home! Authentic Soviet atmosphere, Simple tasty Russian food, Tourist place! If you are looking for a kitschy Soviet-style restaurant, Kvartirka is the place to go! Here you will feel like you are in an old-fashioned Soviet-style apartment, similar to the ones seen in films. The interior colors and walls covered with oriental rugs, copies of famous Russian paintings and pictures of Russia will definitely remind you of the old times of the Soviet era. Putting service aside (a bit slow and disinterested), Kvartirka has the biggest choice of authentic Russian dishes of any cafe in St Petersburg so far: for example, you can try beetroot salad, sour cabbage soup, bortsch, fish soup, draniki, pelmeni, etc. Personally, this is a nice, high-quality Russian restaurant that does not cost the earth, good for a quick bite! Traditional Russian food, Great Russian atmosphere, Buffet menu! Trin-Trava is a popular Russian restaurant chain that you can find all over Russia and in St Petersburg too. Considered a symbol of quality and healthy food that reflects the cultural characteristics of the country, Trin-Trava is a must-try for those who want to eat where the locals do. Anyone here can enjoy the cozy Russian atmosphere and taste simple traditional Russian dishes at affordable prices. The restaurant offers two dining options: the A la Carte menu and the Buffet. If you go, try the buffet menu wagons as it has a pretty good variety of food. From a selection of potatoes, meat and pilaf to salads, fish, fruits and much more, you can eat as much as you want at a modest price. Touristic place, Average Russian food and price, Cheerful atmosphere! If you are looking for a taste of typical Russian food in a setting that will remind you of a Russian peasant farm house, then Na Zdorovie is the place to go. 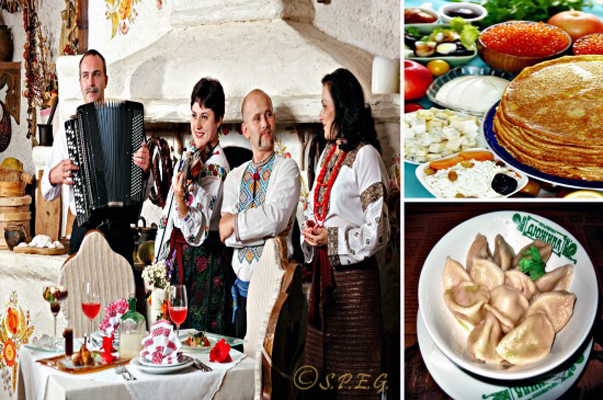 A range of authentic Russian dishes, such as soup with fritters, delicious Siberian dumplings, pies and carp, to name just a few, await you at Na Zdorovie. As the name "For your health" suggests, the food here is good and made just like a Russian babushka (grandmother) would prepare it, but be aware that the portions are small and the staff are not always as friendly as they should be. Perhaps for its interiors decorated with Soviet relics and a mix of traditional Russian crafts or the atmosphere itself, we like it, though some people don't! Good inexpensive Russian food served in a comfortable atmosphere! Different from many other Russian restaurants for its soviet style, Dachniki is simply what it claims to be, a nice cafe serving delicious heartwarming Russian food in a comfortable countryside atmosphere. Popular among locals and visitors, this home-style place offers tasty and inexpensive food along with a good selection of wines and beer. Located underground on Nevsky Prospekt, at Dachniki you can delight your palate and soul. If you go, try their Beef Stroganoff, Pelmeni and Honey-beer! Located in the hinterland between Tsarskoye Selo and Pavlovsk, Podvorye restaurant can be your best choice for a delicious lunch while visiting Pavlosk Palace and Catherine Palace. Everyone visiting Podvorye is sure to taste an outstanding Russian cuisine and get excellent service and food, all served in a traditional Russian setting made of wood and beautiful interiors. At Podvorye everything is done to let you experience the real Russia. Therefore don't miss a stop here, if you are on a tour nearby, because this place is yummy and fun. Small restaurant, Homemade Russian food, Not pricey! Right in the center of St Petersburg, only two minutes' walk from St. Issac Cathedral, you can find the small restaurant Koleso, a cozy and warm Russian restaurant with a medieval touch serving traditional local food along with a wide Slavic menu. If you love to eat meat and drink beer like they did in the old times, and you don't mind sitting in a cave, then Koleso is the place to go. The service is fast, the food is good and the atmosphere and design are fitting. Definitely an unusual dining spot that we're certain you will enjoy, especially if you're looking for a good fill of wholesome Russian food.